Girlia's Cards: Thank You Card and a Winner! I just want to thank you for becoming followers of this blog. I am truly grateful that you stop by and leave comments as well as peeking in to see what I am up to. This card is for you. I am entering this card into my good blogging friend Diana of DL.ART's Thankful Thursday (part II). Everyone knows that my favorite color is blue. I will definitely find every opportunity to use this color. So of course when Diana said use your favorite color I was in (lol). Comments are welcome. Enjoy and GOD Bless! Now onto the winner of Diana's 1 Year Blogaversary Blog Hop! The winner is...Staying Crafty. So Amber you have 4 days to contact me and get me your info. Please tell me what you would like a Gift Card to either Michaels, JoAnn's, Hobby Lobby, or a Cricut Cartridge! Thanks again everyone for playing along and helping me to Celebrate Diana's Blog-a-ver-sary! So simple, yet elegant. Congratulations Amber! Hope you will stop by soon. Beautiful card I knew if I got one from you it would be in the blues and I don't mean sad and I don't mean jazz. Your birds are adorable and I love how you clipped the corners. Thanks for joining in on my Thankful Thursday thank you card challenge and congratulations to the winner. Gloria, this is so cute. Love those birds. I hope I can find some time to use some purple on a card!!! 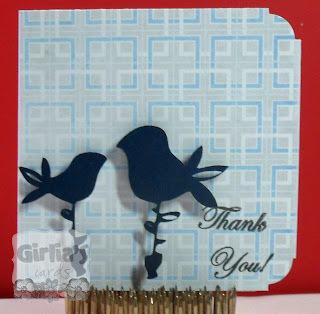 Cute card, love those little birds!! I love the birds!!! I also love the color. Great job. Especially like the color since blue is also my fav color. Congrats to the winner. My post tomorrow 1/8 is in colors I do not normally work with so it was a step out of my comfort zone. BEAUTIFUL CARD... I made a card for her link up too. Gloria, what a sweet and pretty card!!! Congrats to my sweet friend over at Staying Crafty! What a lovely card! Well done! This is stunning! Love this cut! Thanks so much! Very sweet, pretty card stock and cutouts. I love it! Simple, but so pretty!